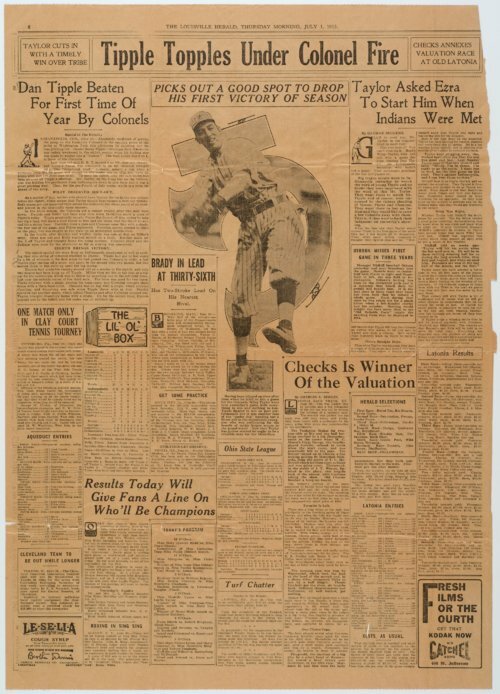 These two newspaper pages from the Louisville Herald and Louisville Evening Post give accounts of the American Association baseball game contested the day before between the Louisville (KY) Colonels and the Indianapolis Indians. The game, which the Colonels won 6-1, marked the first victory of the season for Wiley Taylor, a right-handed pitcher from Louisville, Kansas. His 1915 record with the club would eventually reach 6-7. Taylor played professional ball for several years, starting with the Ellsworth, Kansas minor league team in 1910. Between 1911 and 1914, he pitched in 27 major league games, including three games each with the Detroit Tigers and Chicago White Sox, and the remainder with the St. Louis Browns. His major league record was 2-10, with an ERA of 4.10. In the minor leagues, Wiley Taylor played not only for Louisville and Ellsworth, but also for teams in Austin, Lincoln (NE), Jersey City, Nashville, Salina, and Topeka. After his baseball career, Taylor remained in Pottawatomie County, where he farmed and served four terms as the county sheriff (1925-28 and 1945-48). Late in life, he also ran a service station and recreation parlor in Westmoreland. Wiley Taylor died at the age of 65 in 1954.